Spring is on its way! It's time to bring out those trench coats from storage and get ready for spring! Woo hoo! I like the third one a lot! I am trying to ignore this but it's impossible! This ZARA Buttoned Wedge Shoe is too pretty to refrain me from posting it here. Threy're super nice, eh? 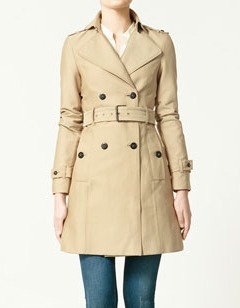 Will definitely look perfect with a new trench coat! i love the wedge! its pink! I, too like the shoes. So pretty! Hello Reya! The wedge is so pretty!